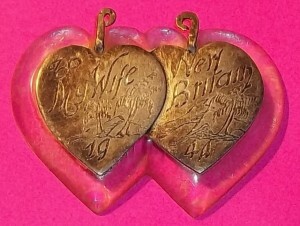 Love tokens had gone out of fashion by the end of the 19th century. The Columbian Exposition timed with the last large production of love tokens. 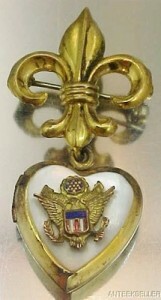 It is believed that love tokens were engraved at fairs and this one would have been no different. There is documentation that box dollars were made at the time of the Columbian Exposition. 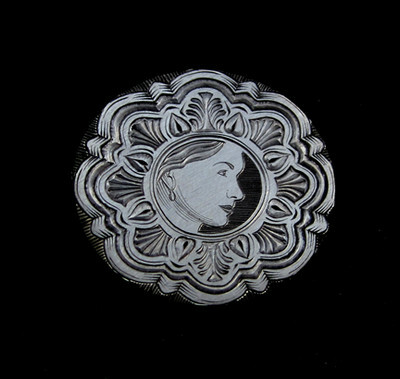 By the 1890’s vast silver deposits were discovered, making silver jewelry affordable to the masses. 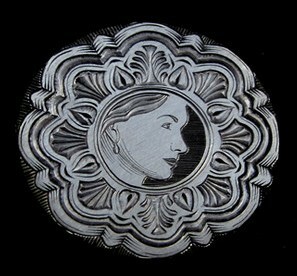 All of a sudden silver jewelry was viewed as déclassé. Gold jewelry was preferred by society and those that could not afford it wore gold plate or “gold shell”. Gold shell was a high quality very thick form of gold filled jewelry, often warranted to wear for 20 or 25 years without tarnishing or the finish coming off. 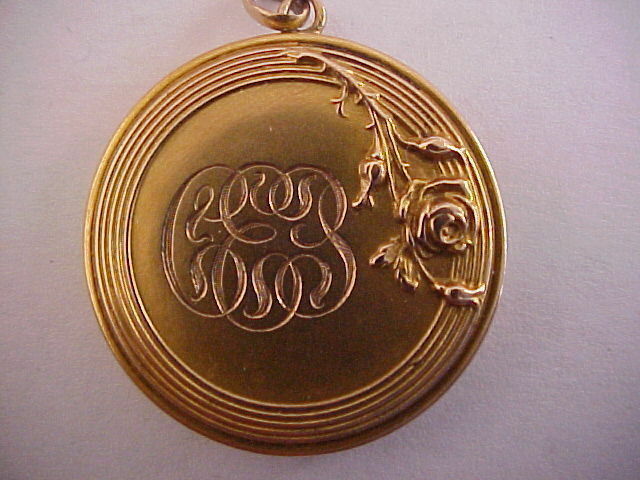 Gold locket with monogram style engraving popular on late date love tokens. 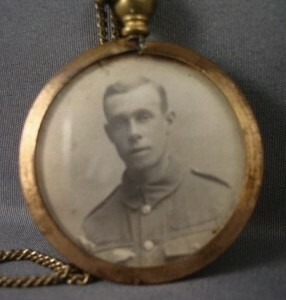 Original photos found inside the locket at right. Photography had become popular and more affordable. Now photographs were printed on paper instead of metal or glass. Exposure times were sped up and subjects did not have to sit motionless for a period of time like they did in early photography. 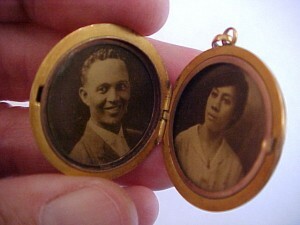 Itinerant photographers replaced the traveling engraver and lockets became very popular between 1900 and 1920. By the 1920’s, Art Deco styles were popular. People were in a new modern century and the organic swirls and details that characterized the Art Nouveau period (1885-1917) were out of favor. 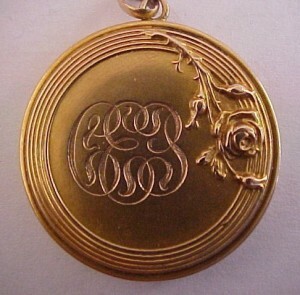 The few love tokens that were made past 1900 were mostly monogrammed (organic Art Nouveau elements) or initials placed in a row using script or simple block style letters. The fancier textured block style triple overlapping initials that characterized the 1880’s and prior were gone. It was once wondered why many of the gold love tokens were so plain? Surely if one were to spend a lot on a gold coin, that person would want it ornate and special. The simplicity of many of these gold coins just speaks to the time in which they were made. 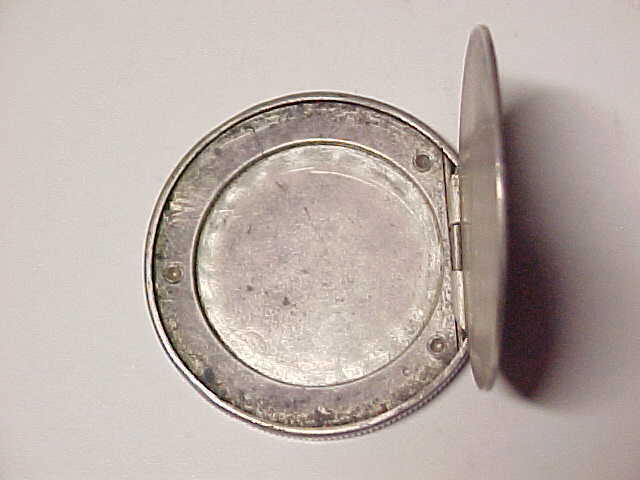 Barber quarter with monogram style initials. Peace dollar with block style letters "EVE" overlay. Simple linear initial format with script letters. Art Deco gemstone bracelets were fashioned with inline construction, one stone set right after the other in a linear format. Square and rectangular stones were very popular. Geometrics, dynamic angles, and minimal design were the poster children for the Art Deco movement. There was also another new style bracelet that came into fashion and helped seal the deal on the love token’s demise; the Forget-me-not or sweetheart bracelet. JMF Co., patent applied for. Transitional bracelet. Circular links are a throw back to coin love tokens. As America moves out of the Victorian era and into the Industrial Revolution characterized by the assembly line, more manufacturers pop up. Jewelry manufacturers appear in more numbers and some jewelry styles were even patented. 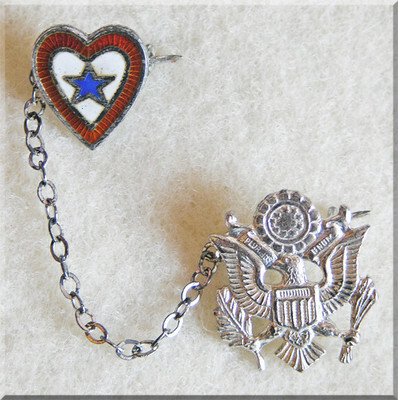 The Forget-me-not or sweetheart bracelets which are named and associated best with the 1940’s, actually appeared on the scene a lot earlier. Both timed in popularity with WW I and WW II. 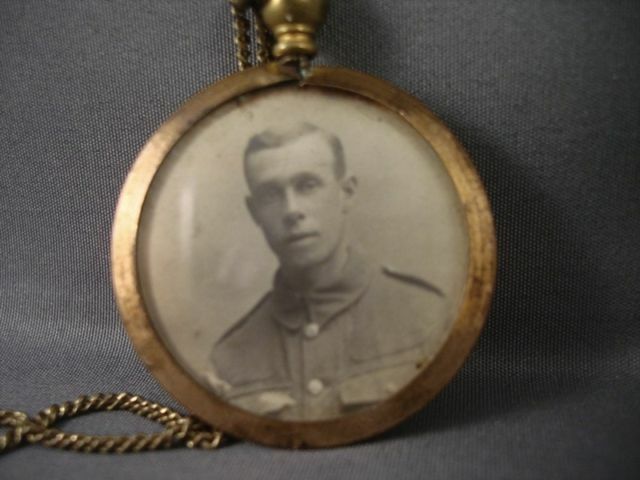 With men going off to war, many people became more sentimental and realized the fragility of life. 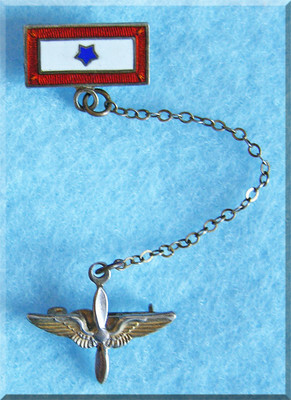 WW II Forget-me-not bracelet with USN emblem. 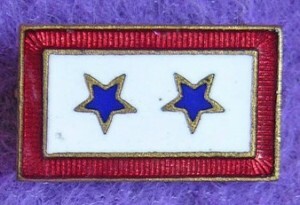 Trademarked "Forget-me-not" on the reverse. 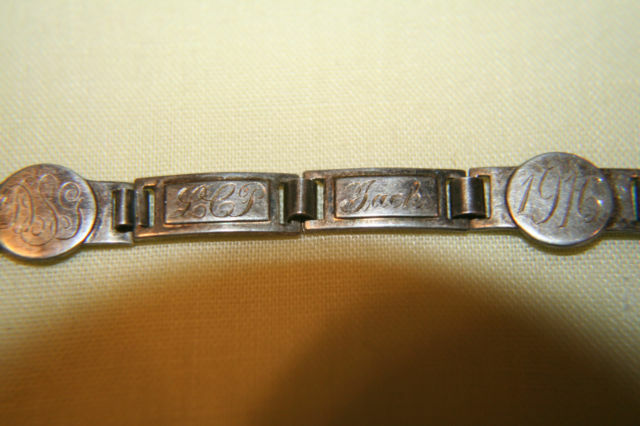 These bracelets were mostly made up of rectangular individual segments that were then engraved with one name per section. The inline construction mirrored the geometric Art Deco aesthetics. They were mass produced and there were no coins to gather, smooth down, drill, solder, etc… Designs other than the names were pre-struck or cast in the metal plaques. This automated jewelry saved the jeweler a lot of time. Even the engraving eventually became machine engraved. 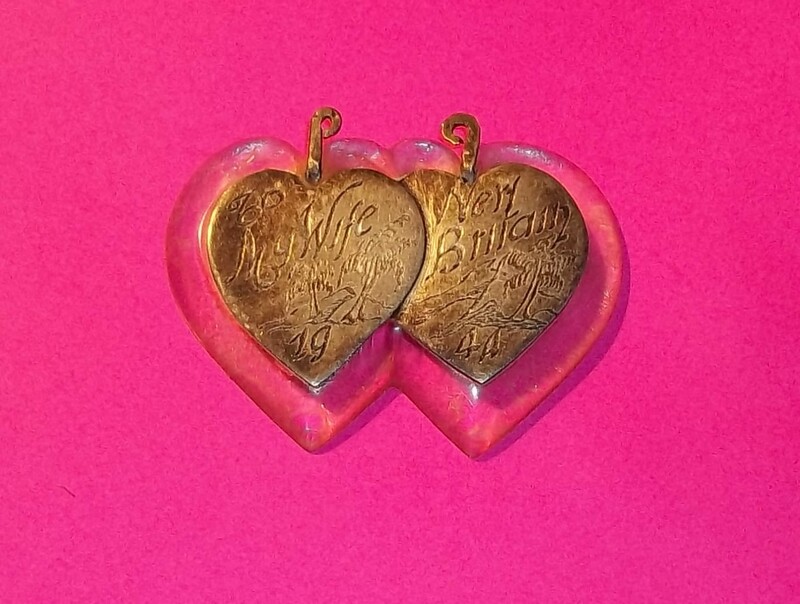 There are a few handfuls of late date love tokens ranging from primitive graffiti scratched in a coin to someone commissioning a modern love token to mark an anniversary or a loved one. 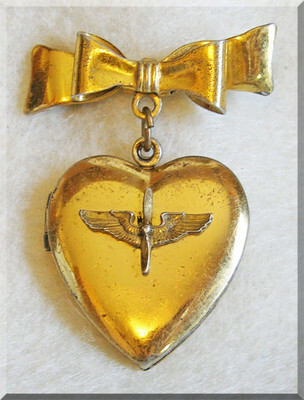 However, the biggest surge of post Victorian love tokens came during the great world wars. 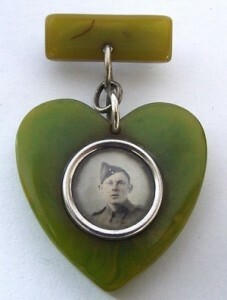 A new art form, trench art, came into being during WW I. 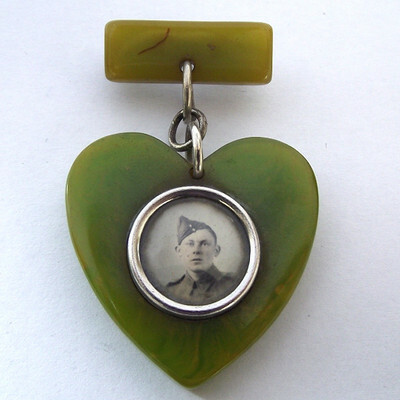 War souvenirs were fashioned using found objects in the field, like unspent shell casings. Foreign coins were collected and some soldiers had them engraved with dates and places served. 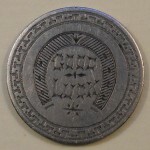 Even images of foreign lands were engraved on the coins. 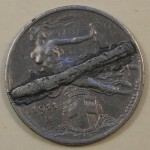 By WW II the emphasis of what was engraved on the coin had changed. 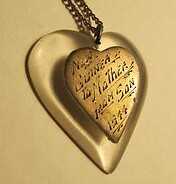 A few were keepsakes with places, but most were gifts for girls, mothers, and sisters back home. “Sweetheart” jewelry had become big business. There was a great sense of patriotism that had swept the country, like none other before. Women showed their support my wearing jewelry with stars & stripes and military insignias representing their loved ones at war. Mother's of soldiers wore jewelry with stars that represented how many sons she had serving in the military. 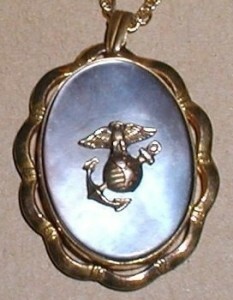 Military insignias along with a mix of lockets. Bottom center is Bakelite. 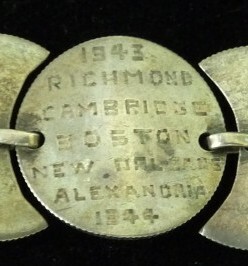 The largest concentration of engraved WW II coin jewelry was engraved on Australian coins. In fact, this form of jewelry was even given its own name, “Pacific War Art.” Some jewelry was made from coins, but other found objects were also used. Tortoise shell and sea shells from the area (Operculum/Cat’s Eye, Cowrie, Abalone, and Mother of pearl) along with Lucite windows and aluminum from downed aircraft made their way into jewelry. 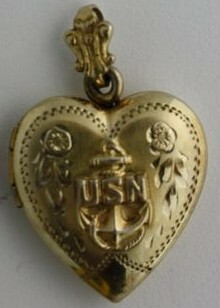 By the 1950’s and 1960’s, there were no traces of love tokens. Charm bracelets were the new sentimental bracelet. Charms representing children, anniversaries, birthdays, places traveled, and such were added one at a time to the bracelet. Husbands bought charms for their wives and mothers bought for their daughters. 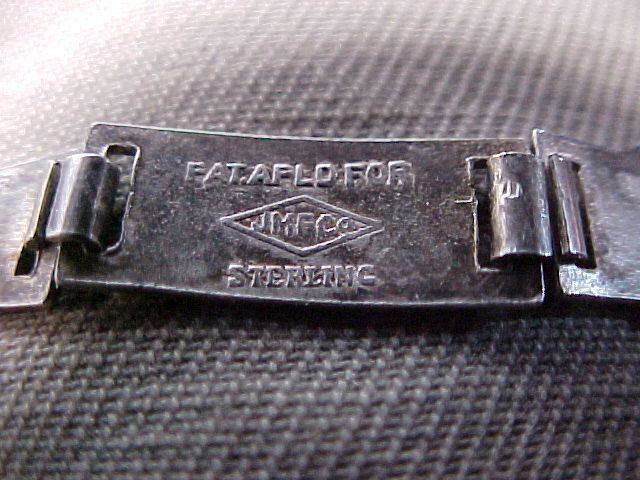 Engraving was still done, but was more often machined. Baby shoes and plaques with silhouettes of either girl or boy children were often engraved with birthdates and names. Mother’s rings also became popular. These rings housed each child’s birthstone. In the 1980’s there were more free form settings added to the offerings, an alternative to the more classic setting. With people having fewer children, companies also began making single birthstone children charms in the 1990’s. 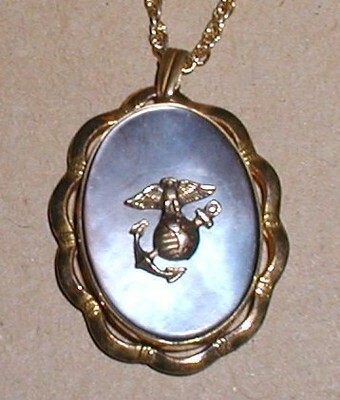 They were worn as pendants or added to charm necklaces which became popular in the mid to late 1990’s. 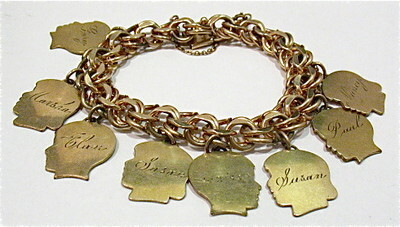 Charm bracelet with hand engraved boy and girl plaques. Modern love token by Andy Gonzales. 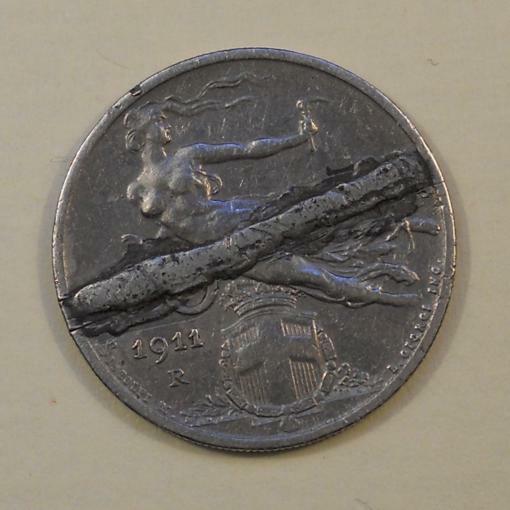 Note the sculpted edge on this 1905 Liberty nickel. 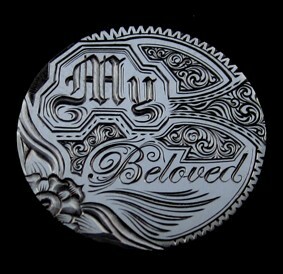 "My Beloved" engraved on a 1900 Liberty nickel. Engraver, Andy Gonzales. The love token hobby is a little different from other hobbies in that the modern love tokens usually cost more than the old ones, so “fakes” are not that big of a problem. 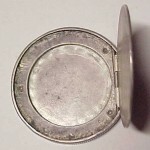 Many of the modern love tokens are done on modern coins or low grade vintage coins. 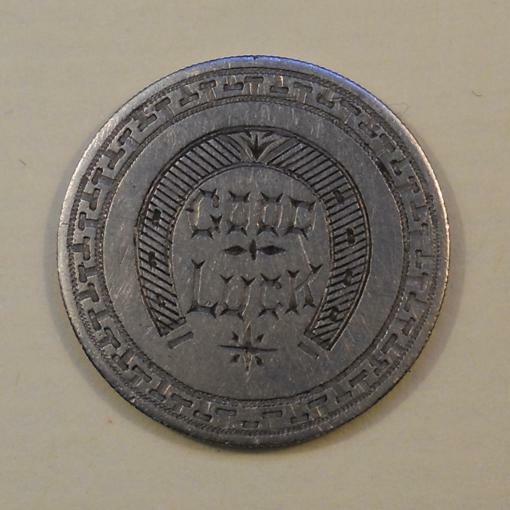 Between the host coin and the engraving style, these new love tokens can generally be spotted without any additional information. Those pictured here, by Andy Gonzales, are more ornate than the majority of original Victorian love tokens.